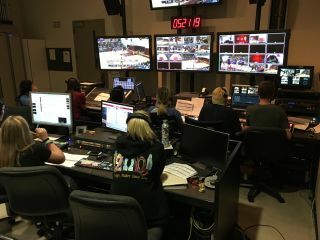 Dodge College of Film and Media Arts at Chapman University in Orange, CA has upgraded its Clear-Com Eclipse digital intercom system to an Eclipse HX system for its IP-based communication capabilities and integration to the college’s FreeSpeak II wireless intercom system and analog intercom system. The intercom system is a key part of the production workflow that supports the curriculum at Dodge College of Film and Media Arts. The existing Eclipse matrix frame was refurbished and upgraded to Eclipse HX for increased operational speed and features. This upgrade gave Goedhart the ability to add the Clear-Com’s IVC-32-HX Ethernet/IP card to significantly expand the college’s communications capabilities with IP-enabled user devices such as V-Series keypanels and the Agent-IC mobile app. To complete the buildout of the system, FreeSpeak II wireless intercom beltpacks and two pairs of transceiver modules (one fiber connected to the sports venue and one for the film school) were added to the system. “No matter what type of show we need to produce, narrative, news, sports, or documentary, we can use the same wireless beltpack hardware in any location. When a student turns on their wireless beltpack, they simply select the configuration for their job and they are ready to go. The FreeSpeak II wireless system is fantastic,” said Goedhart.